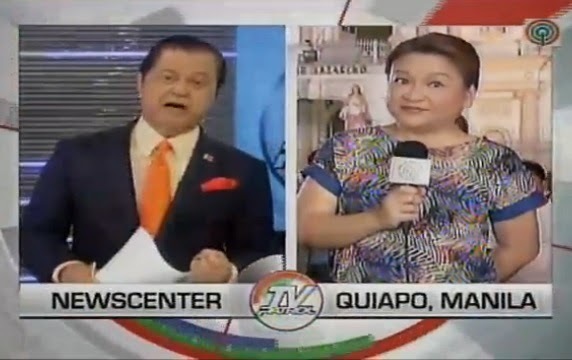 What was supposed to be a usual cross-talk between Noli De Castro and Winnie Cordero on last night's TV Patrol turned into a rather awkward exchange. Cordero, who was in Quiapo to report on the city of Manila's preparation for the feast of the Black Nazarene, was grilled by Kabayan on-air — pressing her twice on whether the city government is really prepared for the upcoming Traslacion. On Twitter, many netizens blasted the TV Patrol anchorman for "being rude" to Cordero, saying that she wasn't given a chance to make her point with his constant interruptions. One of them wrote, "The act that Noli de Castro showed to Ms. Winnie Cordero was very rude! Bakit di mo patapusin si Ms. Winnie sa sinasabi niya? @ABSCBNNews." Knowing Cordero, she probably didn't take it personally. You are such a crappy news anchor Noli De Castro. What you did to Winnie Cordero earlier was so rude. @ABSCBNNews Hindi lang man ginalang o pinaliwanag ni KABAYAN ang ulat ni Ms.Winnie Cordero, ito po ay nakaka insulto sa manonood. Grabe rin itong si Noli de Castro eh. Daming reklamo, di muna intindihin ang report ni Winnie Cordero. Daming alam. Kabayan just got full on diva to Winnie Cordero. Mas mahaba pa yung side comments ni Noli de Castro sa report ni Winnie Cordero. Bale parang nabalewala din yung report. Napahiya si Winnie Cordero kanina. Grabe si Kabayan.